Is it possible to get Fibre installed, where you spend a couple of thousand $$$ to have it installed before the planned 2016 date from Chorus? I don't need a business grade connection for $1000 per month, but would be willing to cover the cost of the install, if it's not the cost of a car.. 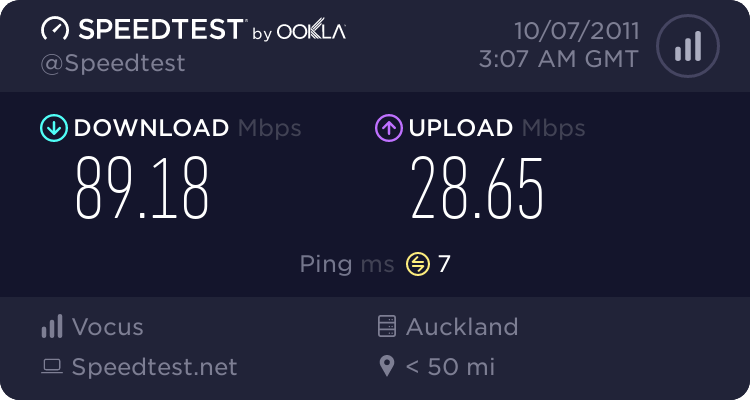 Someone will go into more detail, but short answer is, if you expect to outlay a couple of grand and then pay a normal UFB monthly fee (something like $100) then probably not, unless you are really close to some ISP's POP and they do you a killer deal. Talk to KimDotCom.... he had Orcon roll out fibre to his property - think figures in the area of $20k+ were mentioned.... however, he is quite off the beaten track as it were. Cost of which type car? I've asked about this before and have received conflicting information. I've had Chorus tell me that it's possible and that I need to talk to an RSP, followed by Telecom telling me that I need to talk to Chorus, who then told me that it's not possible (and didn't respond after I pointed out that they'd previously said it is). I wish you luck; you're going to need it! Edit: I'd also asked Gen-i back in 2011. They were happy to install it for the surprisingly low cost of $1400, but wanted $1000/month on top of that for a business-grade connection (which I think was only 10 Mb/s). Behodar: They were happy to install it for the surprisingly low cost of $1400, but wanted $1000/month on top of that for a business-grade connection (which I think was only 10 Mb/s). This... thing is when you start getting fibre installed off your own bat, you're out of the realm of "UFB" and into the realm of "Dedicated Fibre" which costs a factor of 10-100 more p/m. UFB also offers P2P options - and the pricing of existing Chorus P2P fibre is identical to that of UFB P2P fibre. It's also worth noting that the average build cost for UFB from Chorus currently stands at a little over $3000 per premise passed. That'll give you a little idea of the true cost. I had a quote by Chorus a few months ago to get fibre to my house (That is outside the Fibre zone by 2 houses.) I live behind a cabinet that is fibre capable. Quoted $5000+ to run 20M of fibre installed with the ONT. The monthly cost would be $800-$1000. Its not worth your time unless your Kim Dotcom. xpd: Talk to KimDotCom.... he had Orcon roll out fibre to his property - think figures in the area of $20k+ were mentioned.... however, he is quite off the beaten track as it were. add another 0 and then some .... also kim uses a P2P solution not gpon. They should probably lay wherever they get the highest uptake which I would personally guess are more expensive areas. Not sure of the politics of doing that though. Roll out timings are agreed with crown fibre holdings, if they did all the upmarket areas first everyone would cry povo discrimination - can't win either way. Yup, friend moved into a new sub division a number of years ago out that way (long before UFB was even heard of/public knowledge), found she couldnt get any copper service at all, so she asked for fibre - answer was "no, not available for residential customers" - she ended up on Woosh Wireless. Not quite true. She would have been in a BoF area and would have been able to connect to WxC as they were the only ISP to service the BoF areas. Any ISP could offer services, but WxC were the only one that took up the offer from Telecom to deliver services. Telecom themselves couldn't because they didn't (and still don't) have a residential VoIP offering.